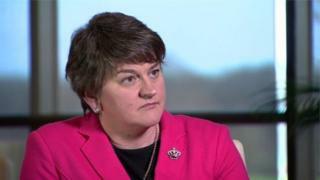 Image caption Arlene Foster said she would not be stepping down as there is a "job of work to be done"
Arlene Foster has said she never thought about resigning as Democratic Unionist Party (DUP) leader in the wake of the Northern Ireland Assembly election. Mrs Foster told Sky News the election had not been "disastrous" but admitted it was a "wake up call for unionism". The election saw an end to the unionist majority at Stormont. Sinn Féin now holds one seat fewer in the assembly than the DUP. Fewer than 1,200 first preference votes separated the two parties. The parties are holding talks to restore Stormont's power-sharing executive and have just over two weeks to come to an agreement or there could be another snap election. Mrs Foster, who has declined a number of requests from the BBC for a one-to-one interview since the election, told Sky that she would not be stepping down as there is a "job of work to be done". "I said back in December the mark of a politician is not what they do during good times but how they tackle the challenges," she said. She also said that it was not up to Sinn Féin to decide who the DUP's nomination for first minister should be. Sinn Féin has said that Mrs Foster cannot serve as first minister while an inquiry is ongoing into a green energy scheme scandal. "We're getting into the territory where we're telling each other who to select. We will want, of course, to say to Sinn Féin we think you should select X, Y and Z instead of A, B and C.
"So they can't tell us who to select as our nominees and likewise we can't tell them." Mrs Foster also said she did not think that there was justification for a border poll that could lead to a united Ireland. Sinn Féin leader Gerry Adams has said he believes Irish unity is achievable through a poll. On Sunday morning, he told the BBC's Andrew Marr Show that his party has a "job of work" to persuade a majority of people in Northern Ireland that a united Ireland was in their interest. "No one should be threatened by this," he said. "Even without Brexit, we've been badly served by the division on our small island." He added that Northern Ireland should be given special designated status within the EU to avoid a "hard economic border" in the wake of Brexit. "This doesn't infringe on the constitutional position but it does guarantee that we won't have the type of misery that's going to be inflicted on our farming, on our dairy farmers, on our agri-food industry or on our enterprises." However, Mrs Foster told Sky that while Brexit "is a game changer" and a "challenge" it was also a "marvellous opportunity" for the UK and Northern Ireland. The DUP campaigned for Brexit in the 2016 referendum, while Sinn Féin opposed it. It is believed that Prime Minister Theresa May could trigger Article 50, the process by which the UK leaves the European Union, as early as Tuesday. The Secretary of State for Exiting the European Union, David Davis, has promised that ensuring a frictionless Irish border is one of his top priorities in reaching a deal with the European Union. Speaking on the Andrew Marr Show, Mr Davies said the government was working to maintain an invisible border between Northern Ireland and the Republic of Ireland. "We have talked to the Irish government about this, the first foreign trip I made was to Dublin. They're on side," he said. "We are determined to do it, the commissioner is on side. The commissioner remember had a part to play in the peace process, indeed Michel Barnier had a part to play in the peace process. "They are absolutely determined in their minds that this is not going to go wrong so that's the combination of determination that exists here."